A group of investors worth £13bn are holding a rally on Monday to push major companies into paying a "living wage". The investor coalition, headed by religious groups and philanthropists in the UK and US, is lobbying the top 100 UK companies to improve salaries. The group is writing to the chief executives of all 100 to ask them to apply "living wage standards". It says say £7.20 an hour should be the floor for wages outside London and £7.85 within the capital. The living wage is what supporters of the campaign say is necessary for an individual to meet their basic needs. The campaign, which has been running for 10 years, is backed by church groups, including the Methodist Church, as well as the Joseph Rowntree Charitable Trust and unions Unison and Unite. Collectively they hold £13bn of assets under management, including shares in major companies. 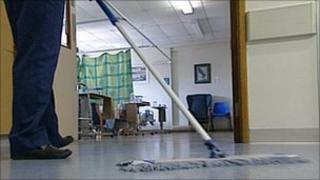 It says there are more than 3.5 million workers in the UK who earn under £7 an hour. The minimum wage is currently £5.93 for adults. Bill Seddon, the chief executive of the Methodist Central Board of Finance, said: " We look at the relationships companies have with their employees, suppliers, and service providers. That leads us to consider not only executive pay levels, but also the lowest paid in a company." The campaign is being run by the organisation FairPensions. The group plans to raise the issue of low pay at a series of major companies' annual general meetings in the coming months. FairPensions has already been to shareholder meetings of Barclays and Royal Bank of Scotland to ask them about paying a living wage. Over the next few weeks it plans to attend meetings at GSK, Capita, Arriva and others. Separately, the PCS union is running a campaign to raise the pay of cleaners at the Royal Household, who are paid £6.45 an hour, above the legal minimum but below the notional "London living wage" of £7.85 an hour, which is supported by the capital's mayor, Boris Johnson. The union is sending a petition that states: "As £30 million of taxpayer's money is paid to the Royal family annually for the upkeep of the Royal Households it is clear that the London living wage of £7.85 is affordable. "Why then are the people who work so hard to maintain standards at The Royal Households, paid so little?" It is asking the Culture Minister, Jeremy Hunt, to raise their pay to the London living wage.